Lindsay Carroll's Giant Dragline, Paul Johnstone's Titanic (now with Tony Parmee's sea motion mechanism), 1959 9.18 triple expansion marine engine SML 11 horizontal steam engine, SML 7 platform scales, MM December 1970 traction engine, 1937 3.4 swiveling jib crane. Edward Bolte's container crane at left. Steve Hatton's Master of the Universe models at right. Walls of the hall surrounded by Meccano Magazines supplied by Bruce Douglas. 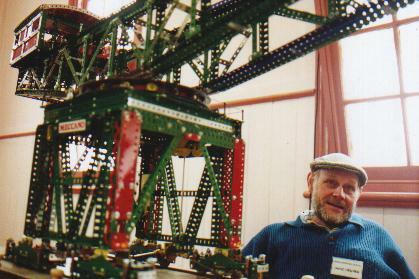 Dave Doddrell, maker of fine Meccano parts, pictured at right (see Home Page for Dave's address). Well! Our first independent Exhibition would have to be judged a riotous success by any measure!! By the 10.00 am opening time some 22 exhibitors had assembled their displays and were ready for whatever lay ahead. Since we had been singularly unsuccessful in gaining publicity for our show in the media, we were quite unsure as to what to expect. However, thanks mainly to handouts at a previous exhibition, word of mouth and a solitary mention on ABC radio, news of our show had spread. Even the weather conspired to be rather miserable for the most part, yet by day�s end some 200 plus innumerable kids had enjoyed their visit. Our exhibitors provided Meccano model and Meccano product displays of an impressively high standard and variety. 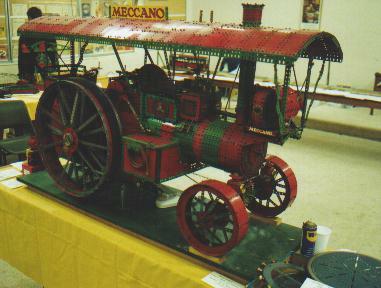 Models ranged from an enormous traction engine nearly five feet long to the tiniest one-model example, made of Meccano from pre-war times to the present. Cranes, cars, trains, trams, ships, windmills, fairground models, engines of many types - examples of all the usual Meccano classics were represented. Particularly fine displays of literature and of clockwork motors were also provided. Fuller details of all exhibits are provided elsewhere in this Newsletter. On behalf of the Committee, I would like to express our appreciation particularly to those who had volunteered for door duty, and who endured without complaint their one-hour stints in such miserable conditions on the day. Bruce Douglas deserves a special thanks for providing an astonishingly impressive display of Meccano literature, the like of which few of us have ever seen before. Finally, I would like to thank our hard-working Exhibition Committee, our visitors and all those who contributed by bringing along and setting up their models and display material, working often against the clock before opening time to have things just right. That our exhibition must have hit the spot, at least for some, is evidenced by the fact that more than one provided an additional donation on the way out. That surely says it all.I�m sure we all look forward to a repeat performance next year - of even higher standard, and involving even more Club participation! The first model which vistiors saw when arriving was Graham Jost's fine windmill which was running out in the front porch of the Main Hall. Once inside and out of the wind and rain there was a magnificent display of Meccano literature laid out in display cabinets around 3 walls of the main hall. This was set up by Bruce Douglas and represented just a part of his literature collection. 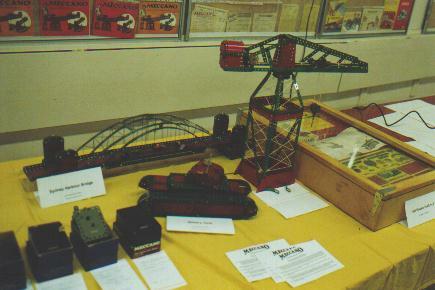 Included were several early Meccano Magazines, a complete set of Super Model leaflets, special manuals from the 1920's and other periods etc.,etc..
Jack Little had set a display of Australian made Meccano imitations produced after the war. Seven were represented: Ezy-bilt, Buz, Betafitt, Toytown, Big Joy, Young Engineers Set and Model-It. Most had a limited life once Meccano returned to the post war scene although Ezy-bilt and Buz thrived for many years. 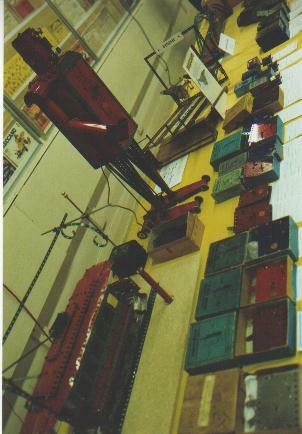 Another display was of Meccano Clockwork motors organised by Jim Osborne. 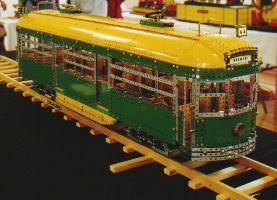 Nearly all examples of motors (in their different colour schemes) were represented including the original No 1 and No 2 ("Trinity") motors made by Marklin and imported by Meccano Ltd.
At the far end of the hall was Jim Osborne's Sydney Tram running along about 4 m of track and taking power from an overhead wire via a trolley pole. It was designed for automatic operation but much of the time it was out of action with Jim's head inside the works - problems with the stop-start mechanism. Once the teething problems are sorted out it will be quite impressive - a very ingenious model Jim. Meanwhile on one of the side tables Jim's bubble blower was happily blowing bubbles, quite unattended. Wal Maynard had his magnificent Traction Engine (which takes 3 people to lift) and his original Geared Roller Bearing (in its box) - very nice Wal. He also had an unusual Spanish electric motor. 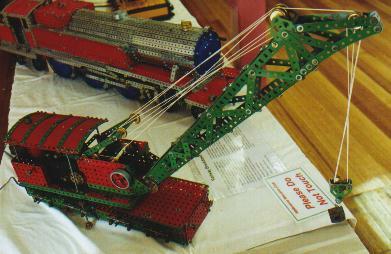 Lindsay Carroll's large dragline (modelled from the illustration on the cover of the late 50's instruction books) was on display. I'm told this was definitely its last outing so if you did not get to see it you have missed out. We expect Lindsay's next model to provide as much entertainment for the club as the dragline. Edward Bolte had his very nice container crane (shiny Meccano and much attention to detail, typical Edward) but it was not operating - the interaction between the movement of the gantry and the hoisting action still need to be sorted out. In the other hall was his Melbourne Tram, again not operating, this time because it was not possible to get power to it in the middle of the Hall. Steve Hatton's display comprised a collection of 5 models from the "Mission of the Universe Set". Paul Johnstone had his model of the "Titanic" complete with a ''sea movement" operation. This is a Tony Parmee device, particularly ingenious in that it repeats itself only after more than 30 minutes (or even some longer period - I'm not sure as I didn't stay around long enough to check). Other models were the Small Traction Engine (from Dec 1990 MM), Jib Crane (No 3 Bl/Gold), Marine Engine (No 9 R/G), Single Cylinder Horizontal Steam Engine (SML 11),and Meccano Platform Scales (SML 7). 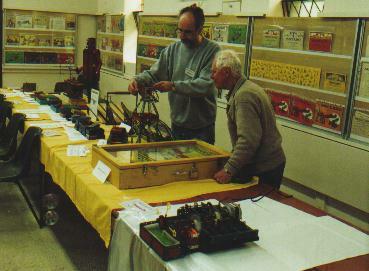 Roger Hall had his now familiar collection of small models from the newer French sets. John Brand had a display of an early 1960's No 3 R/G set as well as some models from set manuals around that period or earlier. These were: Hammerhead Crane (No 5), Military Tank (No 5) and Sydney Harbour Bridge (No 6). Tony Press was displaying his recently acquired model of a Bondi Tram which he has restored. Also on show were the "Meccangaroos" and the Robot (No 8 R/G). I was disappointed not to see this last model working, or wasn't I there at the right time? From the Main Hall it was a hazardous dash through the wind, rain and cold to the Alfred Neufeld Hall. However, the effort was well worthwhile to see a whole lot more models. Alan Middleton had his Caterpillar Tractor based on the original built by Eric Taylor. Overall a very nice model demonstrating considerable modeling skill bearing in mind that Alan had only a few photos of the model from a MM to go on. Nevertheless, with that kind of skill isn't it about time you gave the Hornby Trains a bit of a rest Alan and produced another treat for us Meccanophiles? Next to Alan Bill Fitzgerald had his Railway Breakdown Crane (SML 30) and Baltic Tank Locomotive (SML 15). Graham Jost had his usual large range of models all nicely finished and beautifully displayed. These included: 4-wheel drive motor chassis, Showman's Traction Engine, Ball Roller, Stephenson's Rocket, Locomotion, Tank Locomotive (O gauge), Rock Band, Peddlin' Pete and a demonstration of simulation of hydraulics in Meccano. 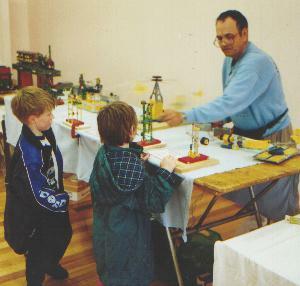 Peter During had several smaller models, some offering "hands-on" experience, including: Aeroplane fairground ride, Acrobat (No 3 R/G), Looping Swing, Crane with electromagnetic grab, Whip Roundabout (No 4 R/G), Hole Puncher and a Moon Buggy fitted with remote control. A good part of the table on the far wall of the hall was taken up by Jack Parsisson's extensive range of fine models - Trench Digger (No 10), Showman's Traction Engine, Rolls Royce (1901), Fowler Ploughing Tractor, Twin Cylinder Steam Engine (SML 32), Double Flyboats (SML 33), Giant Beam Engine (Brian Rowe) and Overtype Stationary Steam Engine. Further along Barry McDonald had set up his display which included a Crane Truck (modified from Evolution Set 6), Mobile Crane (50 set) Crash Tender (Master Builder Set), Octopus Ride (MM 1970's), Weightlifter (MM Newsmag cover) as well as two Multikit Models. 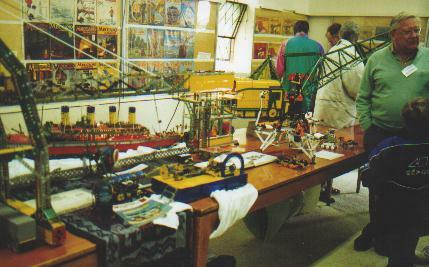 Mark Mason had several models built from some of the more modern sets. There was a ladder truck (Master Builder), Low Loader with Helicopter (one of the motion sets), a V6 Dragster and a Moon Buggy. Craig Webb had brought along a Formula 1 Racing Car of his own design using the contents of the 100th Anniversary Set. John Riley exhibited two nice models constructed in Blue, Yellow and Zinc plated parts - the Train Ferry (No 9 R/G) and the Locomotive 0-4-4 (No 10). Doug Ward's contribution to the models on show comprised: Lion Locomotive (MM Feb 69), a nice example of the Windmill from the R/G No 9 Manual using blue/gold plates, Marine Engine in R/G (No 9) and a Traction Engine. Dave Denner's large Block Setting Crane was on show lifting wooden blocks from a model of a Block Lighter. It was a most interesting and entertaining display. As well Dave had his Grand Prix Racer (Motion System 2). Finally Patrick Russell-Young had his loom which as usual was a great crowd puller. * Numerous small models from modern French sets. * Examples of most of the motors produced between the wars. 1920's to the late 1970's. together with price lists from various periods. 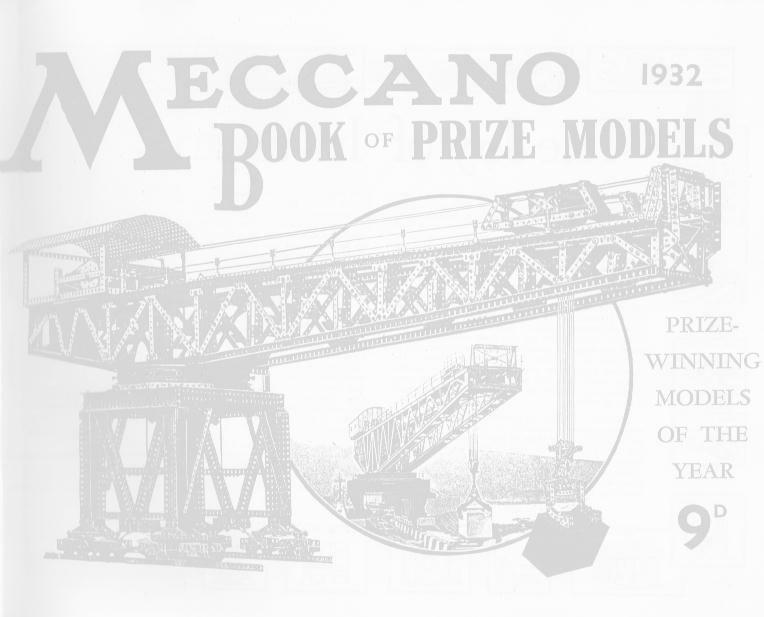 * Meccano catalogues from various periods. Held on 14th October, this was the first annual exhibition in "our" hall - actually two halls now that the Alfred Neufeld Hall has been beautifully extended and renovated. The weather was kind for an indoors exhibition in Spring - cold and wet! 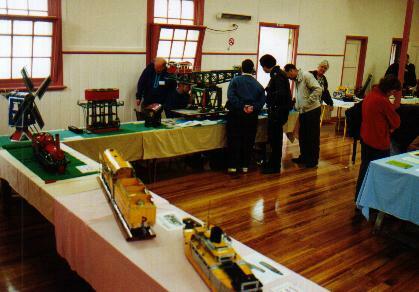 Members had been busy over the winter, with an offering of models and literature that nicely filled both halls. Attendance was most encouraging throughout the day, with their motivation having been recent publicity on ABC radio, flyers posted up in strategic places and at our previous exhibition, Jack Parsisson's signage (see the photo of the hall on the home page); even this website! Thanks to all members and the exhibition committee who worked so hard to make it such a success; thanks to all those hardy Melbourne enthusiasts who attended. Below is a list of members' offerings (hopefully complete and correct - please advise of any inadvertant errors or omissions), with links to photos (if not already shown at right). Apologies to any member whose model is not included at the moment - this is only because the webmaster ran out of film! Due to size limit imposed by webpage hosting service, linked images previously published on this page have had to be deleted. Tony Press' selection, including the Bondi Tram which he auctioned - and himself purchased!- at a club meeting earlier in the year. The track, poles and overhead "filigree" were added for the expo. Trams were a recurring theme on the day - a Melbourne icon! Peter During entertaining the lads. The acrobat was no doubt inspired by the Sydney Olympics. A group photo in the Alfred Neufeld Hall. You can see John Riley's work in the foreground, Doug Ward's at left and Dave Denner's GBSC getting plenty of attention - it must be block-setting time again! Flashing reversing lights were added for the expo. John Brand shows Edward Bolte his hammerhead crane. Dave and the block-setter take a well-earned rest. 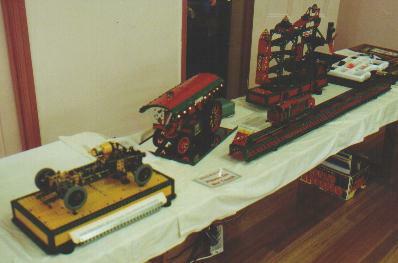 Doug Ward's marine and traction engines. REPORT ON MMC PARTICIPATION AT EXHIBITION BY THE MELBOURNE SOCIETY OF MODEL & EXPERIMENTAL ENGINEERS AT MONASH UNI 30 SEPT/1 OCT 2000. The following MMC Members took part in the exhibition. Dave Denner with his new model of the Block Setter Crane which performed magnificently over the two days with the help of Kimball the Dogman. Kimball Monger displayed a Barge based on Harland & Wolff known as Belfast & Bottom design plus a Douglas Speedway side car motor bike & Fifi Mystere Motor Cycle Whimsey. Lindsay Carroll displayed his dragline & Members please note it did work. Lindsay also displayed his small mini model from CQ plus the Monkey. It now has a partner.